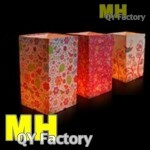 Luminary Candle Lanterns | SkyLanterns, Hanging Lanterns, CandleBags. Candle Lanterns also known as Luminaire Candle Bags, have been used for years especially at Christmas and Halloween. They have also been used for fundraisers for years. Simply open the bag, weigh them down with sand or stones and place a tealight or LED tealight inside. Our various designs and sizes are suited for indoor or outdoor use. 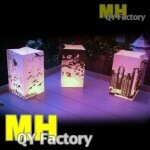 The mini Candle Lantern can be used at dinner or placed around the living room to create a lovely serene atmosphere. The medium size can be used indoors and outdoors. The large can be used to light up gardens or yard mark or enhance walkways. 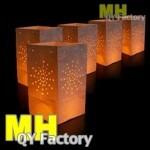 Wherever they are used, candle lanterns create a charming soothing effect for ideal for entertaining or just relaxing. High quality 85 GMS thick paper so they stand better and last longer (most on the market are much thinner). Square (not rectangle) so they withstand more wind. Can be reused over and over. Can make hole punch designs you need. Can also make lovely 4 color prints on the paper. For durable higher quality candle bags, contact us. Beautiful Black and White printing is inexpensive and looks good with fire glowing from inside. &..